Length and width affect speed and maneuverability. When it comes to speed, it’s all about surface area. A long, thin line allows paddlers to slice through the water quickly which is a real advantage if you plan on touring, but a drawback on twisty rivers. A 17 foot-long kayak will go much faster than a 9 foot-long kayak, but a 9 foot-long kayak will turn easier than a 17 foot-long kayak. A narrow kayak is faster than a wide one, but wide kayaks tend to be more stable (depending on hull shape). Depending somewhat on width, flat or smooth-bottomed kayaks (U-shaped) have more secondary stability, while keeled kayaks (V-shaped) have more primary stability. 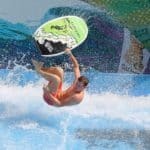 U-shapes may feel tippier at first, but stay stable in moving water (rivers, surf, etc.) while V-shapes feel most stable in flat water. The tri-form hull of most sit-on-tops combines both primary and secondary stability with a long center keel to keep you going straight, and two “shoulders” that act like sponsons for secondary stability. This tri-form hull generally sacrifices a little speed, but adds a lot of stability (which is great for cross-over sports like fishing or diving). V-shapes encourage a boat to go straight (good for touring), and smooth bottoms encourage a boat to spin (good for surfing, kayak polo, or river running). Whether or not a kayak goes straight is referred to as “tracking.” You’ll want a kayak with good tracking to cover distance on flat water, but you’ll want less in whitewater. Chances are, for recreational paddling, you’ll want a kayak with a keel (some kind of V-shape on the bottom), so you can travel more efficiently. If you expect to spend equal time on flat and moving water, consider buying a short kayak with a keel (it’s all a continuum, remember). “Rocker” is another term used to describe hull shape. Think of the keel as something you’d notice on a kayak cut in half. Rocker is most noticeable on a kayak cut cross-ways. A kayak with a lot of rocker would look like a “U” in a cross-ways view. A kayak with little rocker would look like a line. 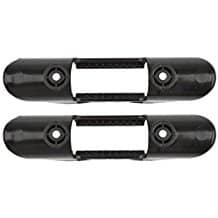 Keeping in mind the idea of surface area and water displacement, you’ll want a lot of rocker (one round point touching the water) for maneuverability, and you’ll want very little rocker (a long, thin line of points touching the water) for touring. Do you plan to paddle solo or tandem? This is one of the most basic questions you’ll have to answer. While one person can paddle a tandem alone, it requires sitting in the rear of the kayak while ballasting the front. The kayak will move, but not at its optimal level. On the other hand, it’s a lot of fun to go out with a partner, often safer, and usually cheaper than buying two boats. There are a few tandem sit-on-tops that have a jump seat between the front and rear seat wells. This seat arrangement makes it possible to balance weight for better performance when paddling alone, and may be a good option to try if you want to paddle both tandem and solo. Your body determines how the kayak will perform. You probably wouldn’t buy new pants without trying them on first. The same rule applies to kayaks. When you test paddle, you aren’t so much looking for mechanical failure as you are trying to get sense of how the kayak fits. It goes beyond just height and weight-people carry weight and proportions in different ways, and these differences translate into how you balance in a kayak. You can always learn how to work with different kinds of kayaks-experts tend to balance better than beginners-but know that it will take time and practice, especially if you decide on a specialized kayak. Inflatable kayaks are exactly what you imagine – kayaks that are inflated and deflated before and after use. They’ve become increasingly popular over recent years, particularly as advancements in technology have allowed them to become progressively similar to hard shells in terms of performance. 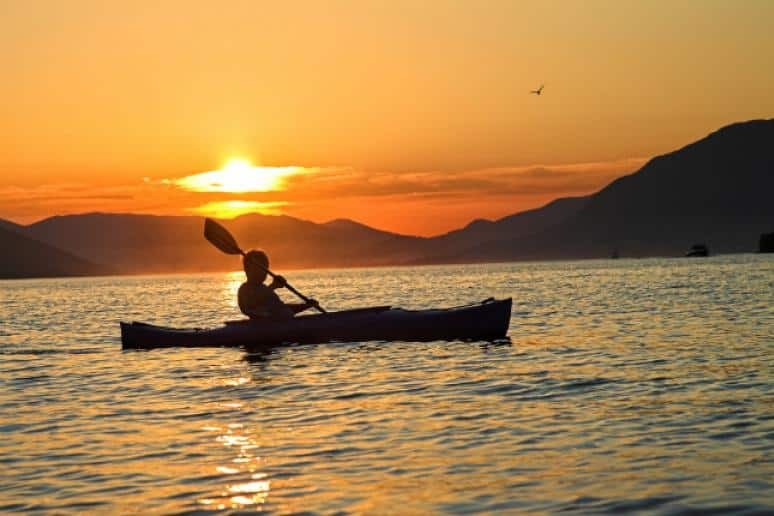 Inflatable kayaks are more stable and less likely to capsize because of the buoyancy, but in inclement weather, hard-shell kayaks are more stable because they sit heavier in the water. This means that the rigid kayaks are also a better option if you want to venture out into the ocean with your kayak. When choosing a whitewater kayak, if you are going to go for very rough waters, you may want the sturdier hard shell kayak. However, as the inflatable material continues to improve, many inflatable kayaks can now handle class IV rapids. An inflatable kayak can be stored in a corner of the garage or in the trunk of your vehicle. They also have tons of storage on board, with a lot of it being dry storage. If you are wondering, “Are inflatable kayaks safe?”, you should know that most are very safe. They have multiple air chambers to ensure you always stay afloat, even if your kayak becomes damaged. However, damage is rare because the material that is used is extremely durable. The Sun Dolphin Aruba 10′ Sit In Kayak, is a great kayak for any water enthusiast. This kayak is crafted of a rugged UV-stabilized Fortiflex High Density Polyethylene hull and features a deluxe adjustable seat with high back support and adjustable foot braces. There are carrying handles for easier portage and a convenient storage hatch and water bottle holder.. The Vibe Kayaks Skipjack 120T tandem kayak is a sit on top kayak perfect for those wanting to fish, explore, or paddle with a companion. The Skipjack 120T is a stable kayak that performs well in surf, rivers, and flat water and is easy to paddle for any age or experience level. Equipped with 3 seating positions, the Skipjack 120T easily holds 2 adults and a child or it can be paddled solo from the center position. The Vibe Skipjack 120T tandem kayak is a great way to introduce kayaking and kayak fishing to someone new. Share the journey with the Yellowfin 130T. Our all new tandem kayak with framed hero seats and foot braces means all day comfort, while the rudder ready hull provides maneuverability and performance. Equipped with 3 seating positions, the Yellowfin 130T easily holds 2 adults and a child or it can be paddled solo from the center position. The Intex Challenger K1 Kayak is sporty and fun with a streamlined design for easy paddling. Great for experiencing lakes and mild rivers with a friend, this Sports Series kayak is perfect for one adult. Lightweight and compact, this kayak is a snap to assemble, and allows you to take the fun of kayaking wherever you go. Made with rugged vinyl construction, this sturdy kayak has an inflatable I-beam floor for comfort and rigidity. Quick inflating or deflating is a breeze with a Boston valve on each side. 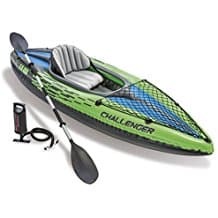 The Challenger K1 Kayak provides added accessories including: two 86”aluminum oars and an Intex high-output pump for easy inflation and deflation. The Intex Explorer K2 Kayak is sporty and fun with a streamlined design for easy paddling. Great for experiencing lakes and mild rivers with a friend, this Sports Series kayak is perfect for two adults. Lightweight and compact, this kayak is a snap to assemble, and allows you to take the fun of kayaking wherever you go. 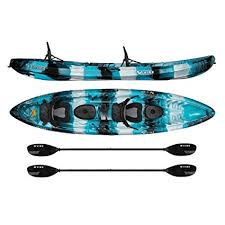 Made with rugged vinyl construction, this sturdy kayak has an inflatable I-beam floor for comfort and rigidity. Quick inflating or deflating is a breeze with a Boston valve on each side. 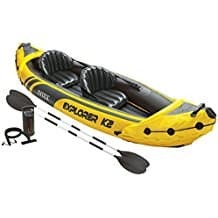 The Explorer K2 Kayak provides added accessories including: two 86”aluminum oars and an Intex high-output pump for easy inflation and deflation. This waterproof dry bag provides superior protection with a great design! Protects from water, dirt, dust, and sand. It is made from durable 500D PVC tarpaulin, with a waterproof level of IPX-3 giving you reliable protection for your valuables. A versatile and complete Paddle leash and Rod leash system with 3 leashes and a (1) carabiner. The leashes have a very unique light tension bungee section that elongates with light forces and retract back neatly. The kit contains 3 leashes and 1 aluminum carabiner to attach your gear to the boat. 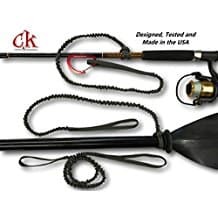 Light weight, small diameter make these one of the best gear leashes available. This quick-dry amphibious shoe goes where other athletic shoes wouldn’t dare to tread. 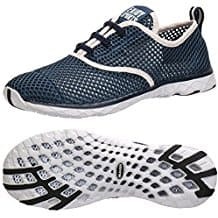 Hydrophobic engineered mesh offers lightweight breathability, while a contrast stitching lateral support system locks down the foot for stay-put performance in or out of the water. 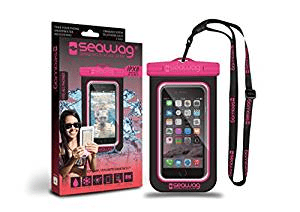 Fully waterproof, Take your phone anywhere, even underwater. Snow proof, dust proof, and sand proof. Protect your device from all elements. Make your phone calls as usual trough the case with touch screen capabilities. Use all functions and applications of your phone. 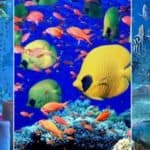 Take photos / videos underwater and make incredible photos and videos underwater. IPX8 Tested to 25m/80ft. This galvanized anchor doesn’t need a painted coating to keep it resistant to rust. The anchor line is 40ft long and allows for more horizontal drag and a better hold. 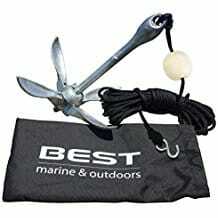 They also include a nylon storage bag, a buoy ball and a stainless steel hook for situations requiring a quick disconnect. The boat anchor is only 12in x 3in when closed. It takes up minimal space and can easily be stored in kayaks, canoes, dinghy, paddle boards or waverunner PWC. Small boats don’t need large boat accessories or supplies. Enjoy a comfortable day grabbing wakes in a Stearns Adult Watersport Classic Series Vest. The comfortable, US Coast Guard-approved PFD is designed with four adjustable chest belts and two large armholes for better movement. With webbed 1-in. straps, a durable 200D nylon shell and PE foam inside, this life jacket is sure to be on the boat with you season after season. Your little adrenaline junkie will enjoy a comfortable day grabbing wakes in a Stearns Child Watersport Classic Series Vest. 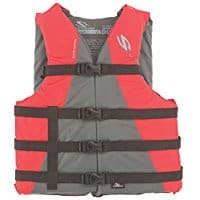 The comfortable, US Coast Guard-approved PFD is designed with three adjustable chest belts, an adjustable crotch strap and two large armholes for better movement. With webbed 1-in. straps, a durable 200D nylon shell and PE foam inside, this life jacket is sure to be on the boat with you season after season. 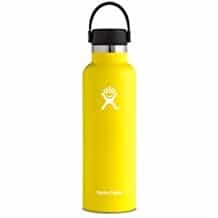 From office to trail, staying hydrated on the go is easy with Hydro Flask. The TempShield technology keeps cold drinks cold for up to 24 hours, and hot drinks hot for up to 6 hours. Stay cool and hydrated all day long, no matter where your adventures take you. Comes in assorted colors. This paddle clip is able to hold your paddle firmly so that it does not slip away. This paddle is to mount in a convenient location on your watercraft It can also be used for gear storage in garage and securing nets on boats / kayaks. I have been kayaking ever since I was a little kid. One of my friends used to live on a lake and I would go to his house every weekend during the summer and we would kayak. I have also been kayaking at many of the places I travel to! It’s always great to kayak through sea caves, streams, and just cool places to go. Great article, if I was ever considering buying a kayak I wouldn’t have any problem picking one out after reading this. Great Adam, I am glad I am on the right track as I know I am much newer to the sport than you 🙂 Glad you enjoyed~! Its so true, there is so much more to see, if your venturing on a kayak. What a great article, really informative, not only on the various kayak’s available but all the other equipment required. There is nothing quite like the freedom of being out to sea and your articles always have a way of wanting me to get out there straight away. Now this looks like a fun activity. I’ve only be kayaking once and loved it. I didn’t realize how cost effective it was to have my own Kayak. Appreciate this share Leahrae. I’m going to by one for my holiday house. Great Vince! It is a lot of fun, not to mention it comes with some exercise. Great sport for out in the water 🙂 Thanks for reading and come back again! Excellent stuff! I’ve been on the river once but this article makes me want to run there immediatelly. Thanks for all the priceless info, very easy to decide now. Glad it was of help to you 🙂 Anything out on the water is wonderful. Glad you enjoyed reading about the best kayaks on the beach! You are welcome Brandon, and yes the inflatable kayaks have come a long way and are just as good as the hard shell, in my opinion! 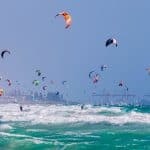 Please let me know if you have any additional questions and thank you for reading about the best kayaks for the beach! I had no idea there were so many different styles of Kayaks, or that your own body size and shape influenced the outcome so much. I guess when people are kayaking, they become “one” with the boat and it makes sense that our own sizes would have so much influence over the experience. I’m tall and large and heavy in the middle, what would be the best kayak for me? Thanks for the great info! Hi Penelope, there are a few choices: Wilderness Systems Pungo 140 Kayak, Old Town Vapor 12XT, Malibu Kayaks X-Factor Fish and Dive Sit On Top Kayak, and the Sun Dolphin Bali SS 12-ft Sit On Top Kayak. I hope this helps 🙂 Please let me know if you have any additional questions. Thanks for visiting! As an outdoors man, I found this article quite helpful. I especially liked how you discussed the impact the kayak’s shape has on speed, maneuverability, and stability. Most people think all kayaks are the same but they each are quite different. I do have a question though. I live by Monterrey Bay in California and it is an excellent place to go ocean kayaking. The waters can be a bit rough though. Would you recommend the 12′ Vibe Kayaks Skipjack or the Vibe Kayak Yellowfin 13OT 13′ for Monterrey Bay? Both seem like good options. I look forward to seeing your answer. The longer kayak, the 13′ Vibe Yellowfin is going to be less susceptible to the water motion and easier to push through waves that might break over the bow. 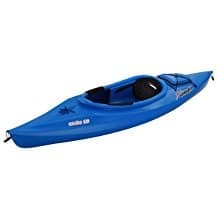 Similarly, a longer kayak can get up to speed where it’s going to be most stable and least effected by water movement. That is the kayak I would choose 🙂 Please let me know if you have any other questions. Thanks for visiting and taking the time to leave comments. I had the pleasure of kayaking with my daughter last summer in Michigan. Actually we went for a nature walk which took us down to a river where they had lots of activities. My daughter is quite adventurous and she choose kayaking. This was our first time doing it, but we had a guide. Of course it was really enjoyable. For sure I will do it again, but will buy my own watersport vest and take it along with me. 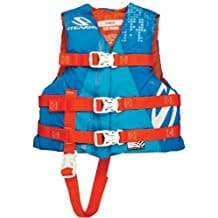 I am thinking of the Stearns Adult Watersport Vest. Is this ideal for female adults? Yes, Carol I have the same vest and so does my son 🙂 We got tired of getting a yucky used one at the beach when we went jet skiing. These are great! Thanks for reading about the best kayaks for the beach. I have been considering canoe or kayaking as a form of fitness for awhile. is there a certain one I should get for a beginner? I would go with the Sun Dolphin for sure. It is a 10 ft. hard kayak and great for beginners. Thanks for reading about the best kayaks for the beach. OH wow, nice! This means that maybe I can get my dad in a canoe too! I am going to check out the Diablo Amigo for him. Kayaking and SUP paddleboarding are both such wonderful sports! Thanks for reading about the best kayaks for the beach! I am also loving the inflatable kayaks. I love going on float trips, and considering I drive a car I also have limited storage space for whenever I travel. Great inspiration, and very fun to read through! Great Melanie! They have come a LONG way with inflatable kayaks, making them a great choice, especially for anyone who does not have the means to carry them on the top of the car. Glad you enjoyed! Great Karen, yes the inflatable Kayak is our choice as well. We have a soft top Jeep, and really no way to put a kayak on top. So the inflatable was the best option! 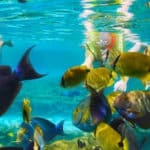 Thanks for visiting BeachTravelDestinations.com and taking the time to comment. My husband and I have wanted to try a kayak on our local river. We have had a couple boats but think kayaking would be fun and something we could get our girls into. I was really excited to see that there are inflatable ones available and can carry more than 1 person. I am anxiously waiting for the hubby to get home so I can show him. 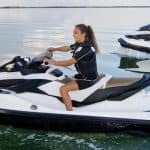 What are your thoughts on beginners and the inflatable one that is on Amazon? We would all 4 be beginners and our daughters are 13 and 10. Intex makes a very affordable, high quality inflatable kayak. They do also come with a warranty, so you are covered. I think this is a great option. My son and I both have the 1 person (he wanted to be in his own! ), and we have a blast. Please let me know if you have any more questions. Yes Tyler, for a first time Kayak, and trying to watch your budget, then the Intex Challenger is a great choice. Still quality made to last. Thank you for visiting the Best Kayaks for the Beach!